Summary from Goodreads: In her debut collection, New York Times best-selling author Holly Black returns to the world of Tithe in two darkly exquisite new tales. Then Black takes readers on a tour of a faerie market and introduces a girl poisonous to the touch and another who challenges the devil to a competitive eating match. These stories have been published in anthologies such as 21 Proms, The Faery Reel, and The Restless Dead, and have been reprinted in many “Best of” anthologies. 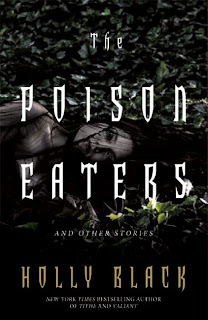 The Poison Eaters is Holly Black’s much-anticipated first collection of stories, and her ability to stare into the void—and to find humanity and humor there—will speak to young adult and adult readers alike. I have enjoyed Holly's writing ever since I read Tithe. She brings her faeries into the "real" world. "The Coldest Girl in Coldtown" was part of the Geektastic collection, Holly edited with Cecil Castellucci, which was awesome, not a bad story in the whole book. Based on that, I know this one will be just as great. I'm definitely waiting on Poison Eaters too - Black's such a wonderful author. And I haven't gotten a chance to read The Mark yet. I plan on it, though. That also sounds like a good one :).